Starting with the 2019 application cycle, students will be required to submit applications to all Health Science and Nursing Programs online. Visit our general FAQ for other application related questions. The application is available on the Medical Education Campus Application Homepage. Only submissions via the new Health Science and Nursing Application will be accepted and reviewed. Any mailed submissions will not be reviewed. The application has been optimized mobile and will allow you to submit with any smartphone. Students should go to their Student Center on NovaConnect (SIS) to update their mailing address. If your name has changed please visit any campus Student Services Center to update your name. Please make sure your personal information is correct in NovaConnect (SIS) prior to submitting any application. A valid MyNOVA username and password will be needed to access the online application. If you’re unable to log into MyNOVA, reset your password or contact the IT Help Desk. If your program application window has not yet opened, you will not be able to apply. Please refer to your program page for details on application windows. You must also fill out all required fields and provide an information session code where required. Please note that not all programs require an information session code. 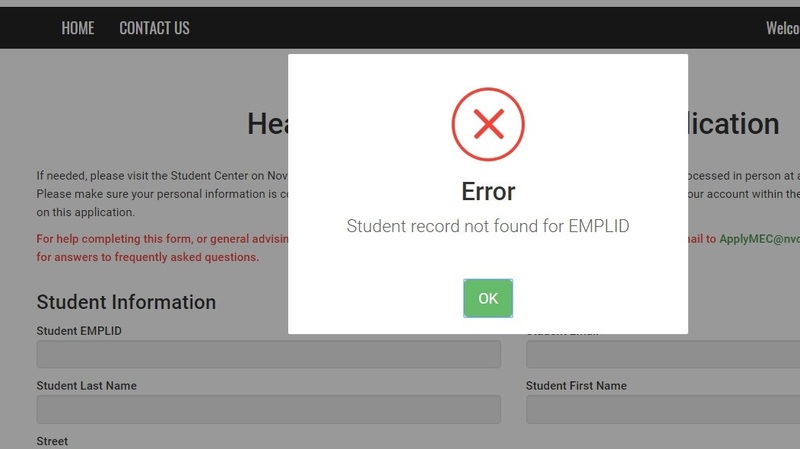 If your NOVA student account is not active, you will not be able to submit the application. You will need to apply to NOVA and activate your account. This must be done 24 hours before you plan on applying to the program. Students will be able to submit any required attachments via the new online application. Campus computer labs are available to students that do not have access to a scanner or scanning app on their mobile phones. The application has been optimized for mobile which allows you to use your phone camera to attach documents from within the mobile browser. If you forgot to attach something an adviser will notify you via email to provide the missing documentation before your application is processed any further. External College Transcripts must be submitted four to eight weeks prior to the application deadline. Do not attach external college transcripts to the application. Visit, the College Records Office website to learn how to transfer external courses to NOVA. If you forgot to attach an item, go to the confirmation email that was sent to you. Click on the View Request link and you will be able to access your application and attach additional items. Do not submit a duplicate application. Students applying to the Physical Therapist Assistant Program are still required to mail their unopened clinical observation hours to 6699 Springfield Center Drive, Springfield VA 22150 Suite 202 using certified USPS mail or Fedex/UPS with tracking. HOW DO I TAKE THE TEAS AT NOVA? If your program requires that you take the TEAS, visit the Medical Education Campus Testing website. There you will complete a form via the link “Paying for the TEAS Test”. Testing center staff will respond with the access code required to pay for the test at the MEC Testing Center. You should submit your request for an access code 24 to 48 hours prior to when you plan on taking the exam.